Congrats to Chelle! 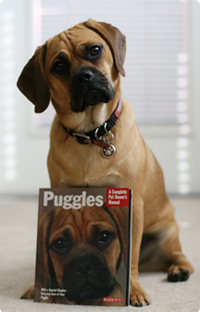 Her puggle book is out! Preston’s puppy picture made it to the cover! He is a celebrity puggle now. What a handsome boy you are Preston! I can’t wait to read more of your daily adventures! You are so handsome Preston! I will try to get you’r book and read it. so cute i have 3 puggles at home missy,chelsy and the doofus ozzy he is so cute and my 2 girls go wild ozzy would go crazy PRESTON IS CUTE!!!!!!!!!!!! Samwich, or Sammie, met you at the dog park. You will probably remember us because her tail curls to the left! How do you get Preston to mind off leash? Sammie has not acquired that skill yet – she is very naughty – she runs the minute she is free!! 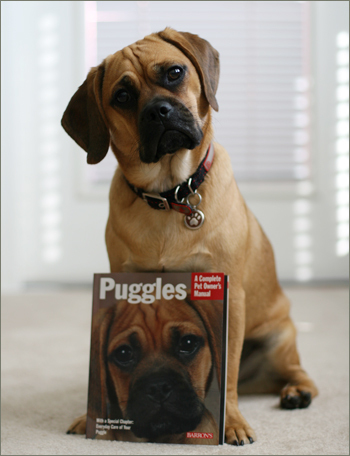 Zeke, our puggle was also in that book! We have this book on our coffee table, it really helped us to get through those puppy years. All the characteristics of a puggle are so very true, Vivienne is a true mommas girl. I *thought* that cover-boy looked familiar! Hi! I just found your site today! Look forward to exploring your site more and thanks for having it! Oh my goodness Preston! You are a handsome fellow and so much like my handsome puggle, Wrigley. How do I subscribe to your blog to follow your adventures?